Kuala Lumpur, 30th August – OPPO Malaysia recently launched the brand-new OPPO F9, its latest F-series product, at the price of RM1,399. To mark the arrival of the F9, the company hosted its first sale roadshow at Sunway Pyramid Mall，Selangor on 30 August 2018 (Thursday). 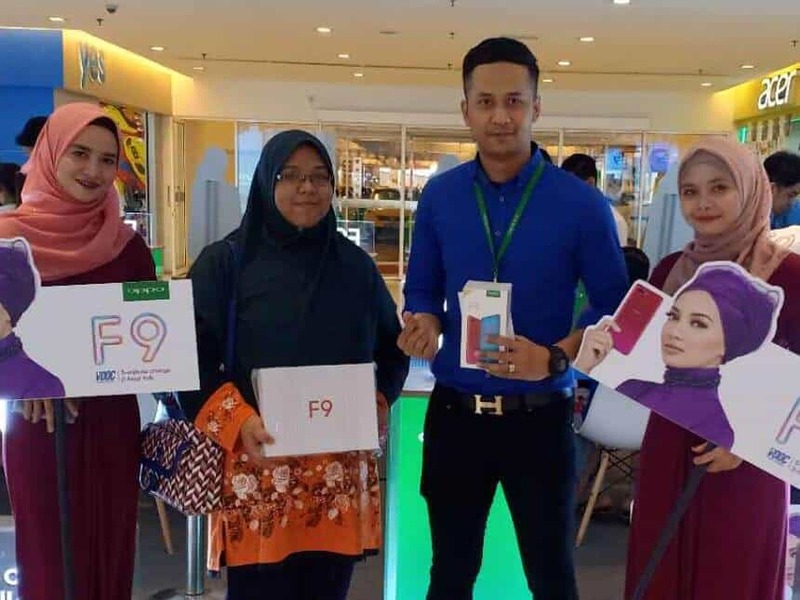 The OPPO F9 also had its first sale today across Malaysia which saw many fans throng to experience and purchase the F9 to the point that it doubled the sales record held by its predecessor, the OPPO F7. Additionally, the OPPO F9 was the No.1 top selling phone that is within the price range of RM1,000 to RM1,500 on its first day of sale among all of OPPO’s telco partners, Maxis, Digi and Celcom. During the roadshow sales, OPPO’s telco partner, Digi also announced its “DP160” phone plan for consumers to gets their hands on the OPPO F9 starting from as low as RM1. Not only that, two rising local stars also made a special appearance at the OPPO F9 debut roadshow – artist Khai Bahar and actor Syafiq Kyle. These two young and talented stars appearance at the event embodies OPPO’s pursuit to create a device that is vibrant and different, which is achieved through its latest F9. Both of them shared their experience of using the latest OPPO F9 during the roadshow while introducing and demonstrating the new and A.I. enhanced dual rear cameras in the latest F9 as well as the VOOC Flash Charge. The dual rear cameras help the processor calculate the depth of field and achieve a great Bokeh effect. While the VOOC Flash Charge technology is a game-changer for people who is always on-the-go. “I’m very excited to be here today to witness the first sales event of the OPPO F9. As an artist, I’m always on-the-go which makes it hard for me to have my phone charged and it always ends up with no battery when I need it most. However, with the OPPO F9 VOOC Flash Charge technology, I only need to charge it for five minutes and I’m good for another two hours. I can now use my phone all day and be confident that I will always have enough battery power!” expressed Khai Bahar. “’I’m honoured to be here today at the OPPO F9 debut roadshow! I really love the new dual cameras because the Bokeh effect is amazing. Through its AI Scene Recognition, the F9 is also able to recognise 16 independent and 800 combined scenes. Not to mention, the new and improved A.I. Beauty Technology 2.1 that helps me take the best selfie yet. The OPPO F9 knows precisely what I want, takes amazing selfies, and it helps me save time, which enable me to share more with my followers,” said Syafiq Kyle. The OPPO F9 boasts a 25-megapixel front camera with a reinvented Sensor High Dynamic Range (HDR) technology that could dramatically improves selfies backlight, it also allows users to check the high dynamic exposure in real-time. Thus, users have a lot more control – regardless of whether photos are taken in bright or low light environments. The new OPPO F9 comes with an enhanced 2340 x 1080 resolution under its 6.3-inch FHD+ screen while sporting a 19.5:9 aspect ratio – a super-high screen-to-body ratio of 90.8%. Users will have two colours to choose from for now which is Sunrise Red and Twilight Blue. Another colour option, Starry Purple, will be available in Malaysia soon. The unique gradient colours design were specially created by the maestro of colour, Karim Rashid. Priced at RM1,399, OPPO F9 is now available at all OPPO concept stores, OPPO Official Website and all OPPO official sales points across Malaysia. Consumers can also visit OPPO e-commerce partners’ site such as Lazada, 11street and Shopee or head to OPPO telco-partners’ store (Digi, Maxis and Celcom) and OPPO chain-stores’ partner stores, Senheng and SenQ to purchase the F9.